One of the greatest miracles is refrigeration. No longer did people have to only fix what they could eat right away. Freezing foods allows you to enjoy them again at a later time. An important step is ensuring that the food will be able to be eaten when it is thawed. Salting and sugar curing did help protect meats but foods still went bad quickly. Many more people probably died from food poisoning than we know about from the days before refrigeration was utilized. At even colder temperatures, food can be frozen. In this state it is kept for much longer. You can prepare something today and then eat it again in two months from now without any problem. Refrigeration allows foods to be kept at a temperature that would not only kill bacteria and also prevent them from growing and spoiling food. Even now, in the age of refrigeration, many people don’t know how to freeze foods properly. How many times have you taken out a plastic bag and couldn’t see the food inside because of a thick layer of frost or chunks of ice? This is one of the drawbacks of freezing but you can hopefully avoid that with the tips mentioned here. Keep your freezer temperature consistent. Look at the thermometer. The temperature needs to stay well below -18 C (or 0F) to achieve a good quality freeze. If you are only storing foods for a month or two, it is okay to do so in the original store packaging. This tip mostly applies to meats purchased from the grocery. Instead of repackaging them, store as is. The exception would be if you have bought in bulk and want to break the pack of meat up into a certain number of portions. Use freezer approved food containers. Only use freezer bags and plastic containers that say they are safe for the freezer. Store food in appropriately sized containers as well. Leave at least 1/2″ headspace for expansion when storing soups and stews. Leave space between items in the freezer. This allows air to circulate all around the food and freeze it more effectively. You can stack items but always leave space somewhere. Do not freeze hot foods. It’s good to let them cool but wait no longer than about half an hour before freezing room temperature foods, and 2 hours maximum since it was cooked. Always squeeze the air out of plastic backs for easier storage and less condensation. Vacuum seal your freezer-bound foods. Use a <a href=”https://www.amazon.ca/gp/product/B00X0WH5TO/ref=as_li_tf_tl?ie=UTF8&camp=15121&creative=330641&creativeASIN=B00X0WH5TO&linkCode=as2&tag=weekbyweek.ca-20″>FoodSaver Vacuum Sealing System </a> to store foods in the freezer without air and moisture in them. Avoid using aluminum foil for certain foods. Acidic items like tomatoes or tomato-based sauces may react with aluminum foil or foil containers. This can alter the taste of the food or make it unsafe. 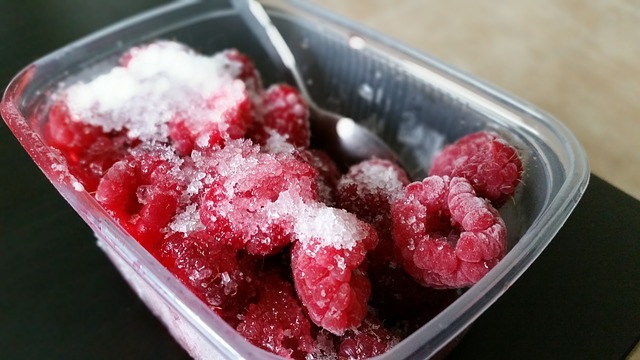 Learning how to freeze foods can save you time and money.